CHICAGO--(BUSINESS WIRE)-- Hyatt Regency Shanghai, Wujiaochang opens in Wujiaochang, a thriving business, innovation and university district in Shanghai, East China. The 306-room Hyatt Regency hotel offers guests an urban retreat that fosters connections and serves as a dynamic, energizing place where they can collaborate and find inspiration. Wujiaochang, meaning “hub of five avenues,” highlights the hotel’s ideal location by enabling guests to easily connect to the very best that Shanghai has to offer. Whether working, meeting, socializing or unwinding, guests can enjoy exciting culinary experiences, easy tech-enabled connectivity and convenient service. “Hyatt Regency Shanghai, Wujiaochang offers guests access to nature and seclusion, right in the middle of urban Wujiaochang. Featuring inspiring spaces and purposeful hospitality, this hotel will provide guests with a memorable place to connect with friends, family and business partners,” said Grace Tsou, general manager of Hyatt Regency Shanghai, Wujiaochang. Hyatt Regency Shanghai, Wujiaochang is located in the Hopson International Plaza, a new tower comprised of Class A-grade offices, a luxury shopping mall and dining and entertainment venues. The hotel is conveniently situated beside Wujiaochang Station on Metro Line 10, providing guests with easy access to and from central Shanghai. Shanghai Pudong International Airport is a 50-minute drive, and Shanghai Hongqiao Airport is less than 15 miles (24 kilometers) by car. Connected with the spirit and culture of its destination, traditional Chinese symbolism is subtly integrated throughout the contemporary hotel design. The artistic journey begins with a sculptural installation of Propitious Clouds, a Chinese symbol for good fortune, in the ground-floor arrival lobby. Eight art panels inspired by Chinese folding screens feature an oversized floral motif – just one of the many stylized nature elements in this garden-style oasis. Upon arrival on the sixth floor Sky Lobby, guests are greeted with an open view into the conservatory garden – a 115-foot (25-meter) high central atrium inspired by the internal courtyard of traditional Chinese residences. Canopied by a glass roof and landscaped in the style of a classic Chinese garden with bonsai, rockeries and flowering trees, the garden is visible to guests throughout the hotel and provides energizing natural light and a picturesque green backdrop for social spaces. 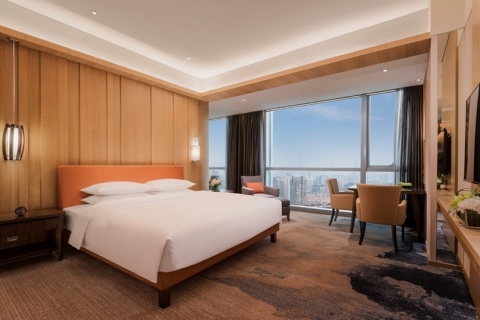 Hyatt Regency Shanghai, Wujiaochang offers 306 comfortable and contemporary guestrooms, including 17 suites, ranging in size from 430 square feet (40 square meters) to 2,249 square feet (209 square meters). All rooms offer views of Wujiaochang and the Shanghai skyline through floor-to-ceiling windows. Complimentary wired and wireless Internet access, a 48-inch LED TV with cable and satellite channels and a Bluetooth stereo help guests to remain connected and entertained throughout their stay. An oversized table functions as both a work desk and an elegant dining table. A large glass window separates the bedroom and bathroom enhancing the sense of spaciousness. A custom painted floral panel door continues the artistic nature theme, and slides to cover the bathroom window and provide additional privacy if required. Seventeen contemporary suites offer a separate bedroom, bathroom and living area. A selection of in-room amenities includes a 60-inch LED TV, Nespresso coffee machine, walk-in closet, marble bathroom, and a large bathtub by the window. Guests staying in Regency Club guestrooms can enjoy access to the Regency Club, an exclusive lounge providing personalized guest services, daily breakfast, all-day refreshments, and evening cocktails and canapés. The restaurants at Hyatt Regency Shanghai, Wujiaochang builds off Hyatt’s history of culinary excellence. Market Café serves an extensive buffet selection during breakfast, lunch and dinner, plus an all-day à la carte menu with Asian, European, American and local Chinese cuisines. Designed to resemble a vibrant marketplace, fresh seasonal ingredients are on display and chefs prepare dishes in the open show kitchens. Market Café extends into the atrium courtyard where guests can enjoy garden dining beneath the glass roof. Accessed through the grand doors adjacent to the Sky Lobby, The Lounge is a memorable setting for relaxing, connecting and meeting during the day and evening. Double-height ceilings, large picture windows and soaring wooden screens set the scene for informal business meetings, light meals and social refreshments. Later in the day, the Lobby Lounge becomes a perfect venue for afternoon tea. By night, the ambience transforms into a trendy lounge with sweeping views of Shanghai’s famous neon lights. Guests can sit at the bar or choose a cozy lounge to enjoy fine wines, champagnes and cocktails, accompanied by live musicians and singers. Perfectly suited for all types of business and social gatherings, Hyatt Regency Shanghai, Wujiaochang offers 30,763 square feet (2,858 square meters) of dynamic and flexible meeting and event spaces across two levels, including the Regency Ballroom and seven multi-function rooms. The pillar-free 8,331 square foot (774 square meter) Regency Ballroom with a 25-foot (8-meter) ceiling creates a sense of festive celebration for up to 700 guests. Styled with rich gold tones and leaf-patterned carpets, doors on one side open onto the landscaped roof terrace. A bridal dressing room provides a pampering lounge and private dressing area beside the ballroom. Guests can enjoy a 24-hour gym on the eighth floor, which features Life Fitness cardio and strength equipment with built-in entertainment and fitness tracking monitors. Inspired by a tranquil pond in the urban oasis, the 82-foot (25-meter) indoor swimming pool with infinity edges is surrounded by glass windows yielding city views. Guests can also unwind in the spacious whirlpool with underwater massage loungers. Soft sandstone floors naturally merge with the pool to create the impression of a natural waterfront environment. For more information, please visit shanghaiwujiaochang.regency.hyatt.com. The Hyatt Regency brand prides itself on connecting travelers to who and what matters most to them. More than 160 conveniently located Hyatt Regency urban and resort locations in over 30 countries around the world serve as the go-to gathering space for every occasion – from efficient business meetings to memorable family vacations. The brand offers a one-stop experience that puts everything guests need right at their fingertips. Hyatt Regency hotels and resorts offer a full range of services and amenities, including notable culinary experiences; technology-enabled ways to collaborate; the space to work, engage or relax; and expert planners who can take care of every detail. For more information, please visit www.hyattregency.com. Hyatt Hotels Corporation (NYSE: H), headquartered in Chicago, is a leading global hospitality company with a portfolio of 12 premier brands and 652 properties in 53 countries, as of March 31, 2016. The Company's purpose to care for people so they can be their best informs its business decisions and growth strategy and is intended to create value for shareholders, build relationships with guests and attract the best colleagues in the industry. The Company's subsidiaries develop, own, operate, manage, franchise, license or provide services to hotels, resorts, branded residences and vacation ownership properties, including under the Park Hyatt®, Grand Hyatt®, Hyatt Regency®, Hyatt®, Andaz®, Hyatt Centric™, The Unbound Collection by Hyatt™, Hyatt Place®, Hyatt House®, Hyatt Ziva™, Hyatt Zilara™ and Hyatt Residence Club® brand names and have locations on six continents. For more information, please visit www.hyatt.com.